Who’s That With Those Skinny Legs? 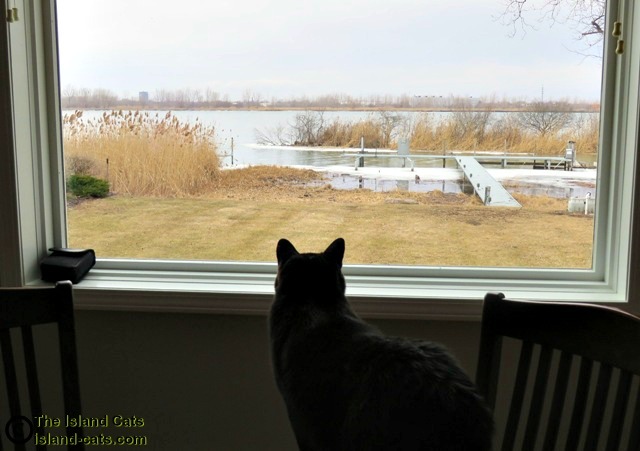 – The Island Cats…Every Cat wants to be an Island Cat! Hi guys. Y’know…Bird TV at our new house is way better than at our old house. We get so many more interesting programs to watch here. 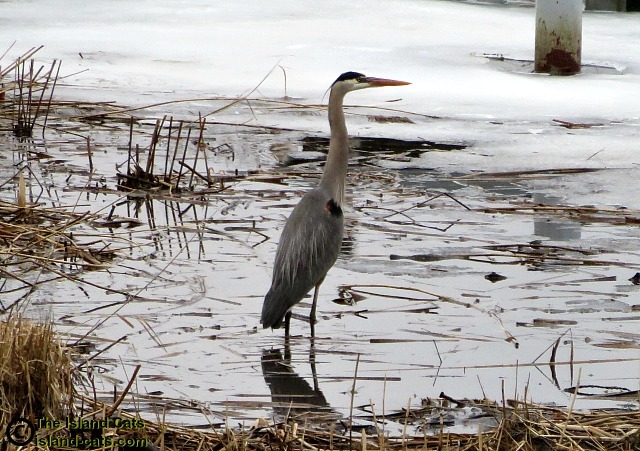 This big guy…though honestly, it could be a girl…is a Great Blue Heron. I’ve never seen one of these before, have you? He’s a big bird…standing a few feet tall. But he sure has some skinny legs! It’s a wonder he can hold himself up on those sticks. He even managed to find himself a snack in the water. If you look real close you can see he’s eating something. Probably a fish because that’s what they like to eat. He eventually flew off. But I sure hope this won’t be the last time he visits us. Love your new neighbor! Hoping he/she comes back for many visits. Bet he/she will! We have lots of them around here!! They’re really cool! That is some amazing bird Ernie! WOW! Those legs look dangerously skinny but then I bet he likes the nice and long and lean so he can clomp around in the water looking for snacks easier! You do get the best bird TV now – just another thing to love about the new house! What a beauty that variety. He resembles a cormorant for my part of the world. I hope you all are doimg okay. Love from us. Isn’t bird TV the best. Yes it is. Jumpin’ catfish that bird has long parts and pieces. Looks like Bird Tv is looking great from your big screen television. They really do have some skinny legs. Maybe some more different kinds of birds will make their debut to the show in the upcoming weeks. Thanks for the share. Have a wonderful day. WOW! Your bird TV just busts open the gates! WOW! That is really cool Bird TV! Ernie, TBN (The Bird Network) has a new channel for Island Cats! Have a fun new week! Wow, Ernie, your new house is the best! That’s an awesome sighting! My kitties would love that too! your view is spectacular and your new friends will keep you entertained for hours! to the hospital this morning. Will write about it on the blog tomorrow. What a kewl lookin bird Ernie!! 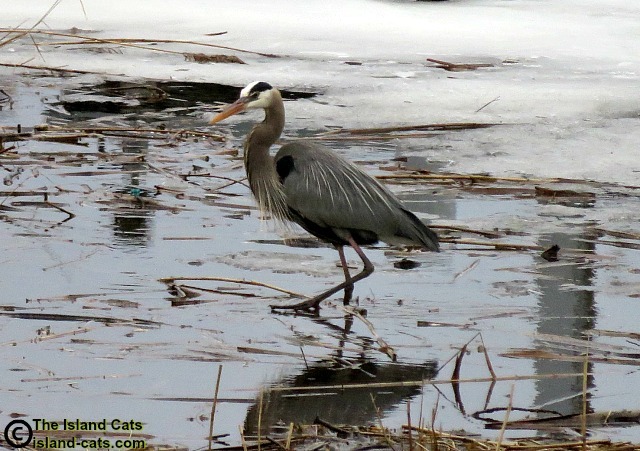 Mee nevurr seen a Heron bee-fore. LadyMew told mee that they have their own terry-tory so mee thinkss hee will come back soon!!! MOL Thinner than our legs here! 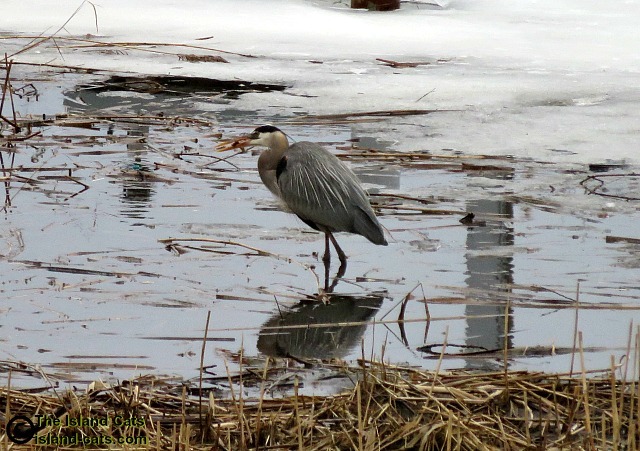 We get herons here and they used to help themselves to fish from our neighbour’s small lake. He put a wire fence around it which stopped them as apparently they won’t fly in to the water to catch the fish, they like to wade in. Wow, you do get some pawsome TV channels there! he’s beautiful! I am so envious! We had some of those at a conservation area in Toronto and they were amazing! You have a great view there, Ernie. You must really love it. OMC! Ernie, that bird looks to be bigger than YOU! Whoa! I like to eat fish but I’m not a bird. Can we possibly have something in common? Oh, where did you think the phrase “bird legs” came from to describe a girl with skinny legs? We certainly don’t have that channel! You’d think that water would freeze those skinny legs! Wowser! I never get an birds like that on my bird TV! Score! How cool! Our Bird TV looks nothing like your channel. We do get lizard TV, do you have that there? That’s some awesome Bird TV for sure, Ernie! Yeah, Ernie. Sometimes we see those birds along the shore of White Lake over here. Usually they stand really still with one leg crooked up, and then suddenly stab down with their beak. They usually have a fish then. Glad your bird TV has that channel. Awesome bird tee vee! You are living the dream, guys! Whoa! That’s definitely a tall bird all righty! What a great channel! You have fantastic bird t.v. channels at your new home! The heron is beautiful. Wow, up close and real! We see those here but fling rather than wading. Petcretary does see them in the pond or creek edges around here. What I sometimes see in the filed across the street from our den are sandhill cranes…now those *are*big birds!! MOL! You sure do live in a beautiful area. Wow! Now that’s some great bird TV!